The government's committee has selected former deputy transport minister of Ukraine Pavlo Riabikin as candidate for the post of director general of Boryspil International Airport state-run enterprise (Kyiv), the country's largest airport. According to a posting on the website of the Economic Development and Trade Ministry, on December the tender to select the airport head ended. Riabikin has 29 years of professional experience, in particular, at Express Avia, Partners housing company LLC and Zeleny Port recreation center LLC. Riabikin was lawmaker in the parliament of the third convocation, and was deputy transport and communications minister in 2005-2006. Since 2014, he has been working at Kyiv City Administration in charge of infrastructure and transport construction. 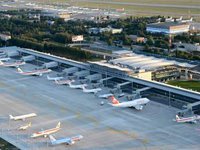 Boryspil airport services over 68% of passenger transportation in Ukraine. It is the only airport in the country servicing long-haul flights. Over 50 airlines fly from the airport on more than 100 routes worldwide.